The colourful landscape of the Vipava Valley is truly a sight to behold. 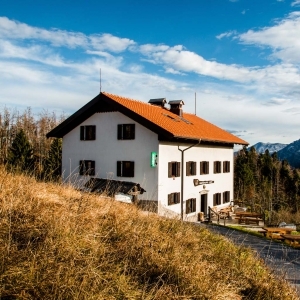 The valley with its undulating countryside, steep crags and tall plateaus offers hiking trails of various difficulty, all of which captivate with their vistas, surprise with their landmarks and excite with possibilities for a cosy rest and great food. If special is what you're looking for, this is the place to see – any season. One of the prettiest sceneries of the Vipava Valley is painted by its hills. Numerous trails that aren't too demanding will take you through vineyards, orchards, meadows and sparse forests. Mediterranean influences grace the land with bright days and a long vegetation period. All year round, even in winter months, the Vipava Hills offer terrific travels and unforgettable memories. To the east and north, the Vipava Valley in enclosed by plateaus. The crags overlooking the valley are a popular destination for adventurers. Rather quickly, one can ascend to heights between 600 and 800 meters, stepping into an entirely different climate. In summer this means pleasant freshness, and in winder a frosty experience requiring some extra clothing. When the Burja wind is ramping up, most slopes are sheltered from the gale and still as inviting as always. Any month of the year. 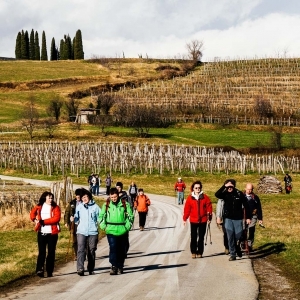 Hikers whose preferred challenge is the mountain peak have much to discover in the Vipava Valley during all seasons. The best known peaks such as Mounts Nanos, Čaven, Mali Golak, Kucelj, Škabriel and Sabotin are accessible all year round. Views from these peaks are breathtaking, in clear weather reaching all the way to the sea. Rare flowers and wild critters abound, perhaps you might even stumble upon a fossil. A uniquely special setting in every sense, every step of the way. Due to its surrounding natural treasures, the Vipava Valley is the perfect base camp for numerous and diverse hiking journeys. 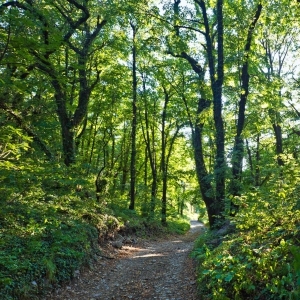 Less demanding trails are found throughout the Vipava Hills. Most of them lead to the villages of Vipavska whose characteristic architecture is an endearing sight. If you feel like peeking inside and savouring some amazing local food and wine, the people are always happy to open their doors. The steep slopes of the Nanos, Gora and Trnovo plateaus offer even more options for amateur as well as extreme sportsmen who enjoy running cross country here. The taller peaks are perfectly sized for hiking, too, while daylong expeditions alongside the edges of the plateaus are especially nice, offering marvellous views far and beyond. Descending back into the valley, you will pass many genuine local farmsteads offering homemade delicacies. A perfect way to round out your trip.